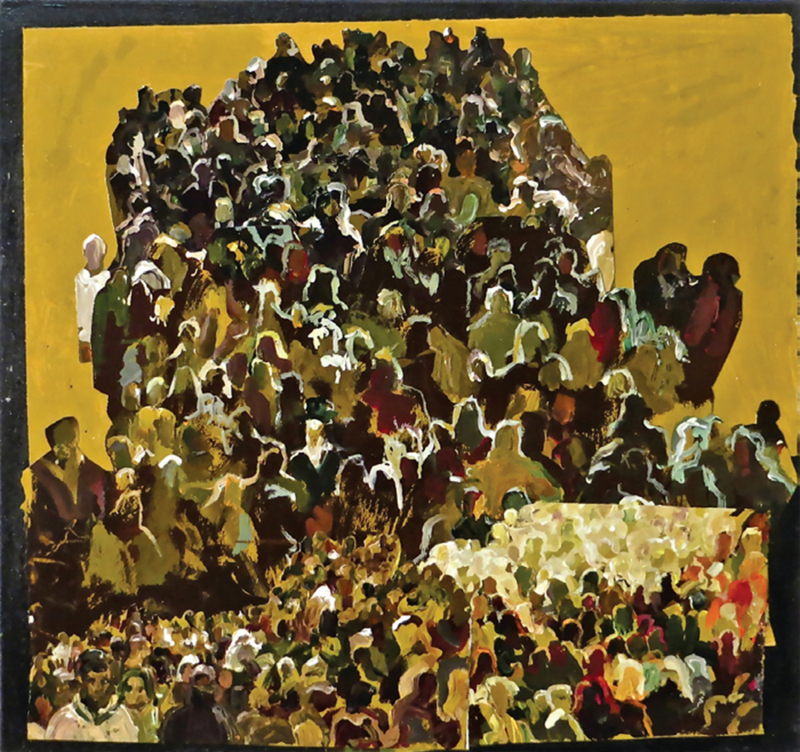 View of “The Shadows Took Shape,” 2014. 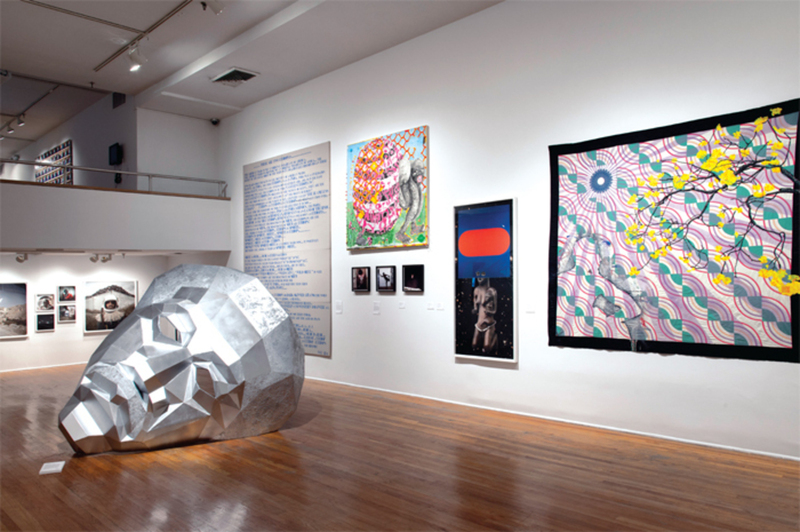 Foreground, from left: Derrick Adams, WE><HERE, 2013; Lili Reynaud-Dewar, Interpretation, 2010; Trenton Doyle Hancock, A New Creature #1, 2013; Harold Offeh, Covers. After Betty Davis. They Say I’m Different, 1974, 2013; Harold Offeh, Covers. After Grace Jones. Island Life. 1985, 2008; Harold Offeh, Covers. After Funkadelic. Maggot Brain. 1971, 2013; William Villalongo, Sista Ancesta (E. Kelly/D. R. of Congo, Pende), 2012; Sanford Biggers, Vex, 2013. Photo: Adam Reich. 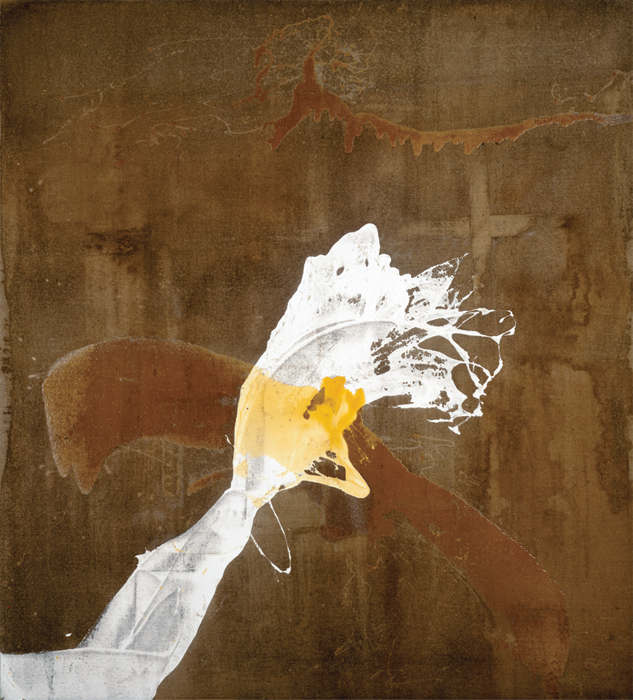 Julian Schnabel, Untitled, 1990, resin and gesso on burlap, 120 x 108". Julian Schnabel’s “View of Dawn in the Tropics, Paintings, 1989–1990” exhibited twelve largeno, hugeworks that reveal yet again that, for this artist, everything is up for grabs. 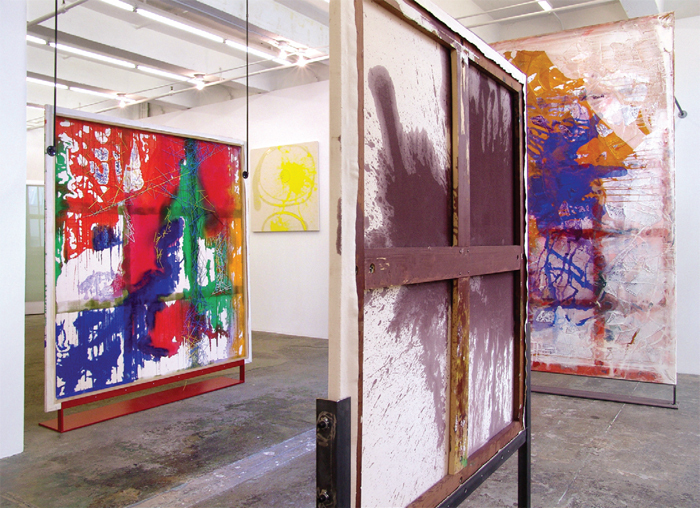 Take, for example, the drop cloths, tarpaulins, and the paint-saturated sailcloths Schnabel used as brushes to spread paint upon his groundsthemselves fashioned from canvas or burlap or what have youthat become, in turn, new grounds or surrogate passages of paint. 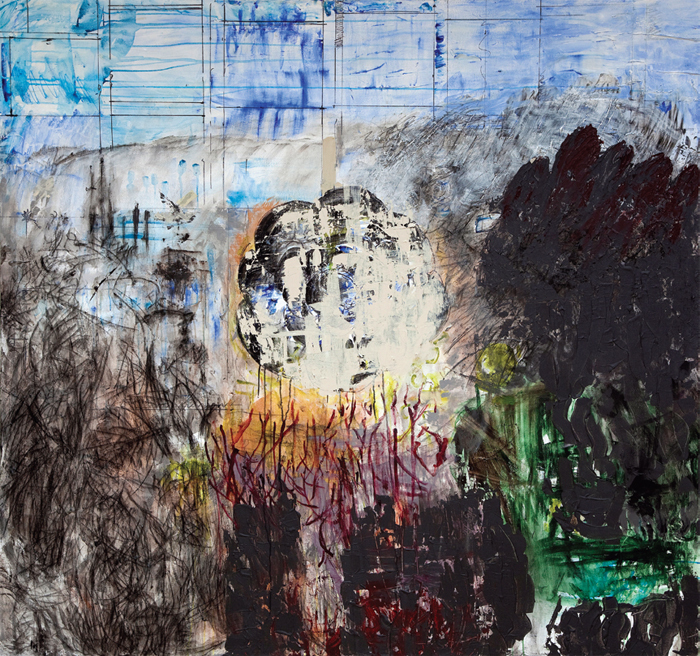 Ghada Amer, Amina, 2013, acrylic, watercolor crayons, embroidery, and gel medium on canvas, 50 x 60". 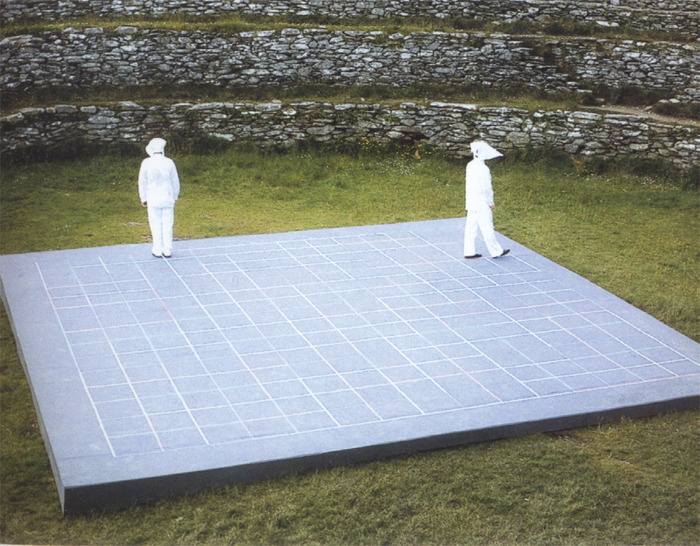 Brian O’Doherty, Structural Play: Vowel Grid, 1970, video, color, sound, 15 minutes 43 seconds. 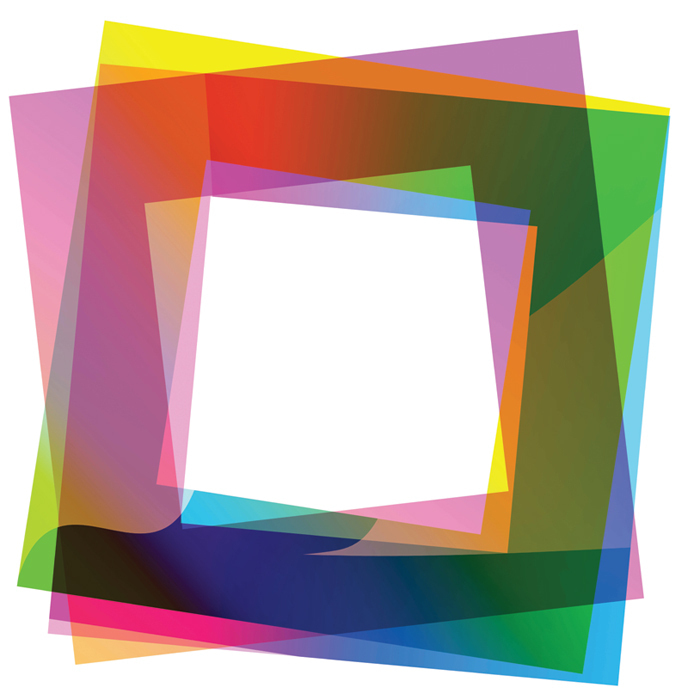 View of “Robert Mangold,” 2014. For this commanding exhibition, Robert Mangold presented a group of ten paintings (accompanied by twelve drawings) executed between 2011 and 2014. Characterized, most saliently, by the wide holes cut into their centers, the spare, donut-shaped canvases explicitly recall the artist’s “Ring Paintings,” 2011, and “Frame Paintings,” 1983–85, and find him continuing the exploration of the fundamental elements of compositionof line, shape, and colorthat he undertook in those series. 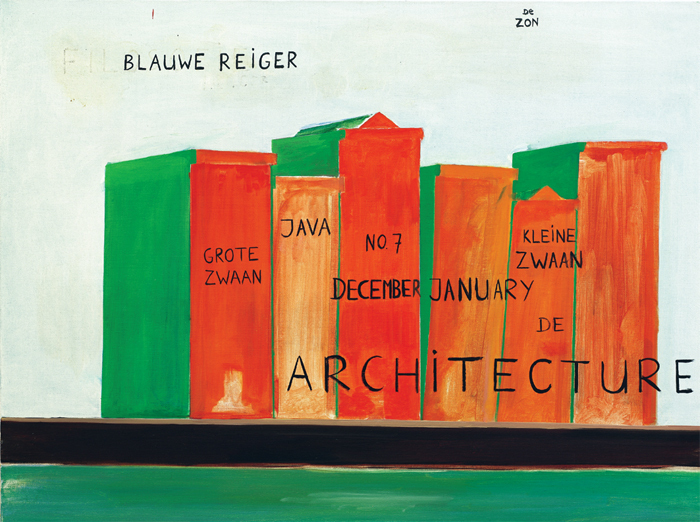 The works are imposing; the largest, Angled Ring I, 2011, has dimensions exceeding eight by eight feet. René Daniëls, Kades-Kaden (Quays-Quays), 1987, oil on canvas, 41 1/2 x 55 1/8". Robert Rauschenberg, Music Box (Elemental Sculpture), ca. 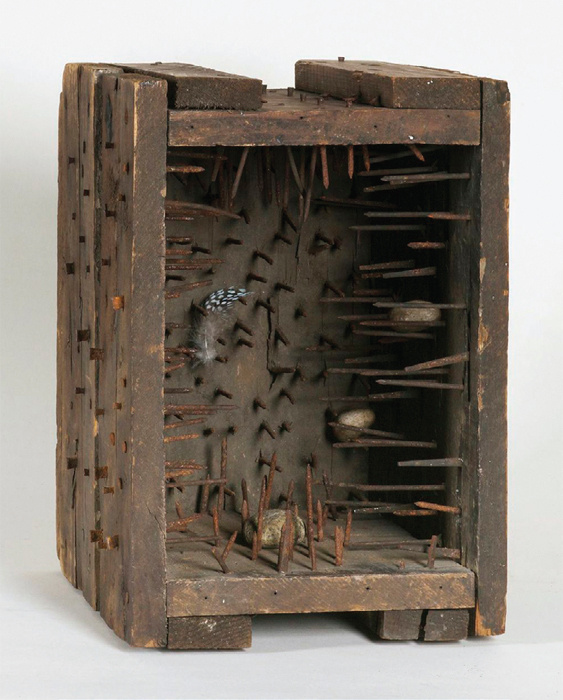 1955, wood crate, nails, stones, feathers, traces of metallic paint, 11 x 7 1/2 x 9 1/4". 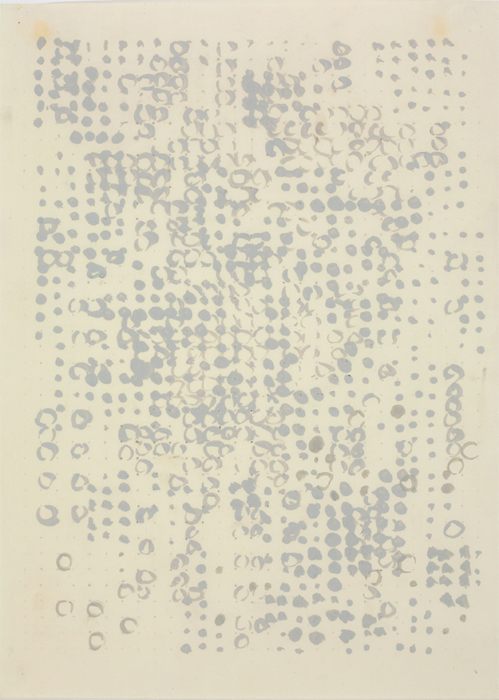 Charlotte Posenenske, Rasterbild (Grid), 1957, casein on paper, 17 1/4 x 12 1/4". 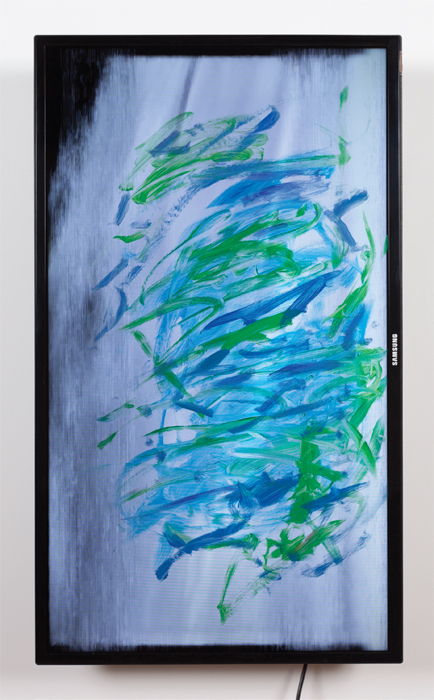 Ken Okiishi, gesture/data, 2014, oil paint, flat-screen television, VHS transferred to digital video, color, sound, 73 minutes 35 seconds, 36 3/8 x 21 3/8 x 4 3/4". 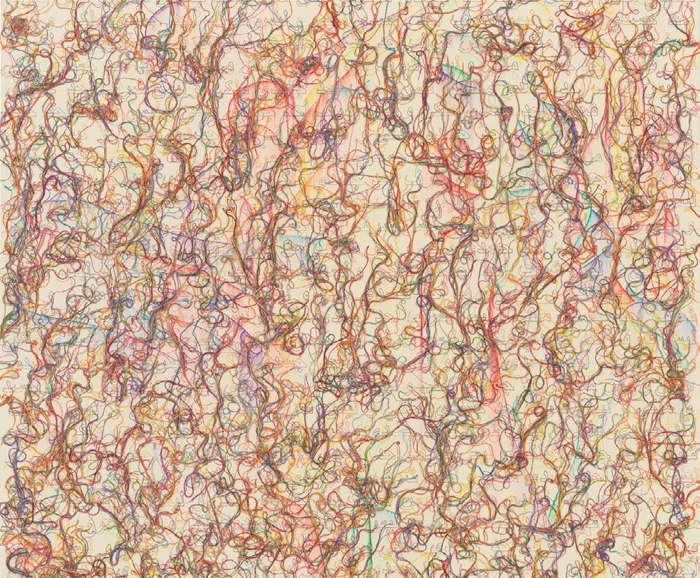 In the eleven paintings that were in this show, all equal in size and in identical thin black frames, densely expressionist or allusively calligraphic brushstrokes bunch or stutter across shimmering color fields. You had to dip your head ninety degrees toward your left shoulder to read the name of the Old Master, stamped in silver and running up each frame’s right-hand edge: SAMSUNG. View of “Dona Nelson,” 2014. Arnold Mesches, Eternal Return 7, 2013, acrylic on paper mounted on canvas, 20 x 21". From the series “Eternal Return,” 2013–14. Connie Fox, Sammy’s Beach VIII, 2010, acrylic on canvas, 73 x 78". The shore of Gardiners Bay on the east end of Long Island is, nominally, the theme of “Sammy’s Beach,” 2007–, a series of acrylic paintings by Connie Fox. Thirteen such works were on view in this exhibition, accompanied by five charcoal drawings from the series “Weeds,” 2010. The two groups comprise gestural abstractions distinguished by compulsiveness and distress, and all are marked by an interplayinvariably dramatic, often violentof black and white. 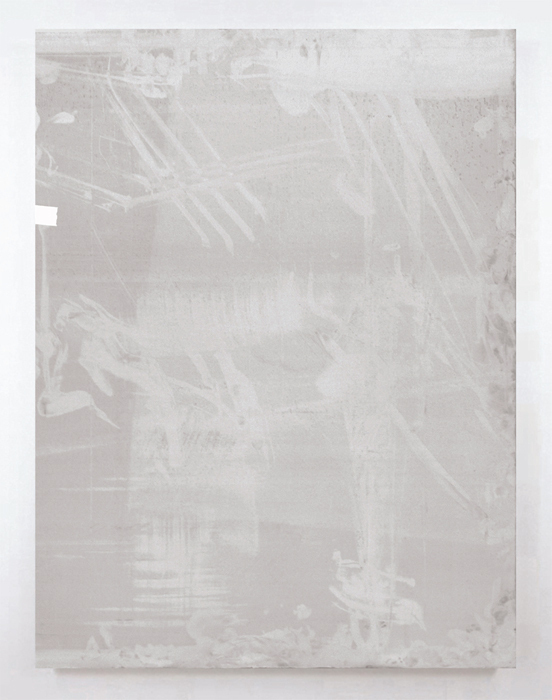 Sylvan Lionni, Dust, 2014, acrylic and urethane on aluminum, 40 x 30".